Wheeler Hall packed with students listening to Dr. Craig's talk on the existence of God. Over the years we've hosted different speakers and teachers to help us grow in our ability to answer both questions from others about our faith and our own questions and doubts. Dr. William Lane Craig has had a big impact on us in both regards. 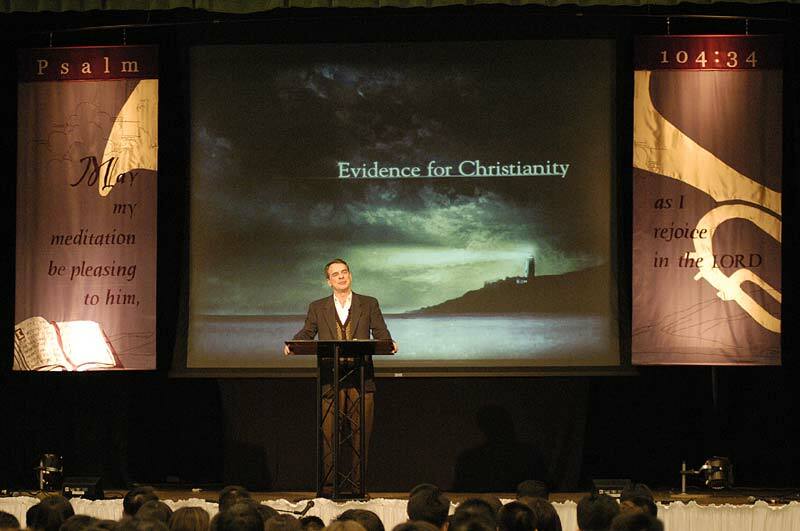 Dr. Craig is renowned in the world of Christian apologetics. His book On Guard and his Reasonable Faith website and ministry are go-to resources for anyone beginning their study of apologetics. Dr. Craig cogently articulates the claims of the Christian faith and has engaged in fascinating discussions and debates with the likes of Sam Harris, the late Christopher Hitchens and recently with Jordan B. Peterson. We dug through our Flickr and Vimeo archives and unearthed a few pictures and videos from his visits to our church! More than 10 years ago, we hosted him for a few talks including one on the existence of God, another on the historicity of the resurrection, and he even preached the message at our Sunday worship service. Dr. Craig's talks are often followed by a Q&A time. 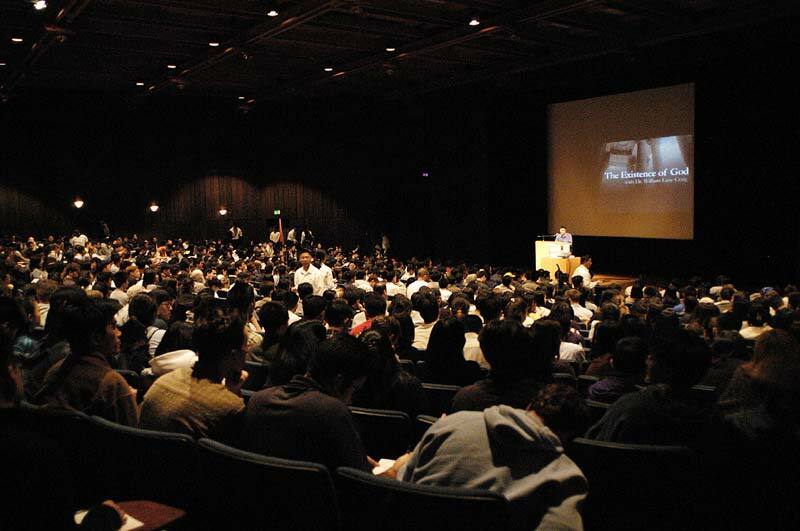 Berkeley students lined up for a chance to engage with him. Dr. Craig delivered a message on the evidence for Christianity at our Sunday worship service in Berkeley. Pastor Ed gave Dr. Craig a DVD as a thank you gift—yep, they still used DVDs back then! In 2010, Dr. Craig came back to Berkeley and gave a compelling argument for how an all-powerful, all-loving God can exist amidst a world of suffering and pain. During that trip he also gave a talk called, "How Do We Know Jesus Was Raised from the Dead?" to a gathering of youth students at Rise, an event hosted by our Interhigh ministry. We're grateful for how Dr. Craig has inspired us to think clearly and to increase our knowledge of the evidence for the Christian faith we hold. We recently had our SoCal-wide College Winter Retreat. Many students wanted to make God their top priority, and felt the need to grow in knowledge of God’s Word. It’s been encouraging to see students—even freshmen—challenge themselves to come to campus for 7am DT once a week! 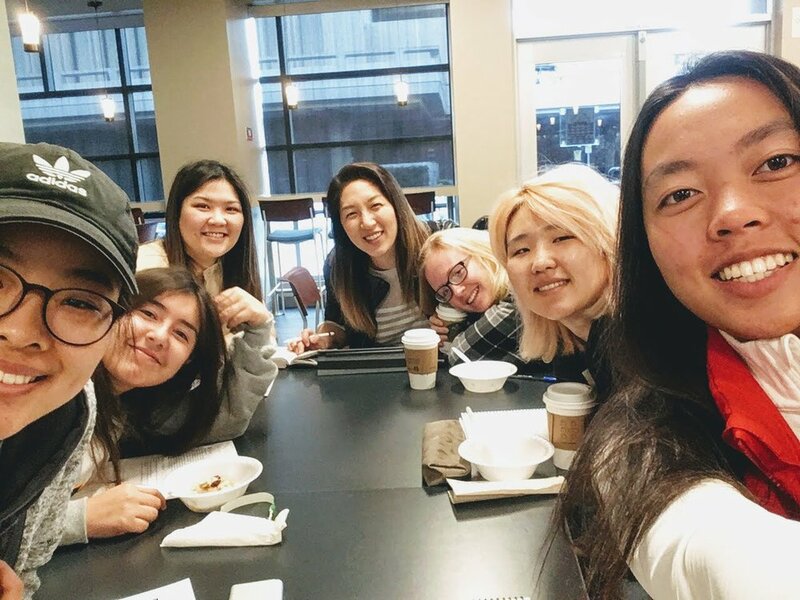 5 freshman girls have been coming faithfully every Tuesday at 7am, and the junior girls and guys have been meeting on Tuesdays and Wednesdays at 7am. Our student leaders have also been meeting for 1-1 DTs with freshmen who can’t make mornings. It’s been a refreshing experience seeing the upperclassmen take the word of God so seriously. Some junior girls have even challenged themselves to read the entire Bible in one year. Not to be outdone, the junior bros are memorizing the 100 Bible verses every self-respecting Christian should know. 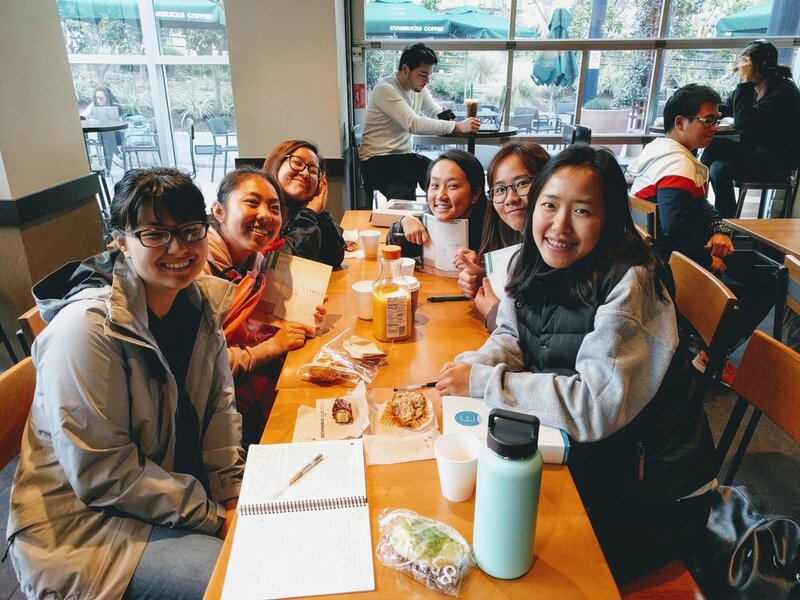 Michelle Wang is a college minister at Gracepoint Irvine. In August 2015, after working for 15 years as a high school English and History teacher, Emily Kim became our official church librarian. Emily, our church librarian and #1 Gracepoint Bibliophile with her prototypical stack of books! Soon after, Emily launched Bibliopolis: a church library specifically geared toward children and teens. Emily recognized the effect that our 21st century, instant gratification culture was having on our youth. In a 2016 Breakpoint article, Eric Metaxas explained how the rise of technology has impacted psychological health, social skill development, and academics. A study by Microsoft concluded that, "The average attention span among American youth is about 8 seconds, less than that of a goldfish." Just last year, Pew Research Center discovered that 24% of Americans hadn't read a single book all year. Emily created Bibliopolis to promote the love of reading throughout our church and to raise up life-long readers across Gracepoint Berkeley and our church plants. Emily writes, "As Christians, it's so important for us to learn how to engage our minds and enter into dialogue with an author about sustained arguments, ideas, or imagined worlds and characters so that we can become more reasonable, thoughtful, attentive students of the Word, and equipped to fight against all that is in the world that that tells us that the here and now is all there is!" Emily spurred us on through programs like reading challenges, a Bibliopolis blog, and curating a mini-city of books for children and adults alike. At Bibliopolis headquarters you'll find an array of plants, Ikea furniture, warm drinks, and plush rugs positioned to create a warm, welcoming environment conducive to reading and it's become a beloved corner of our church for readers of all ages. Enjoying Halfway Herbert in Bibliopolis. Books range from picture books for elementary school kids to chapter books for older students. 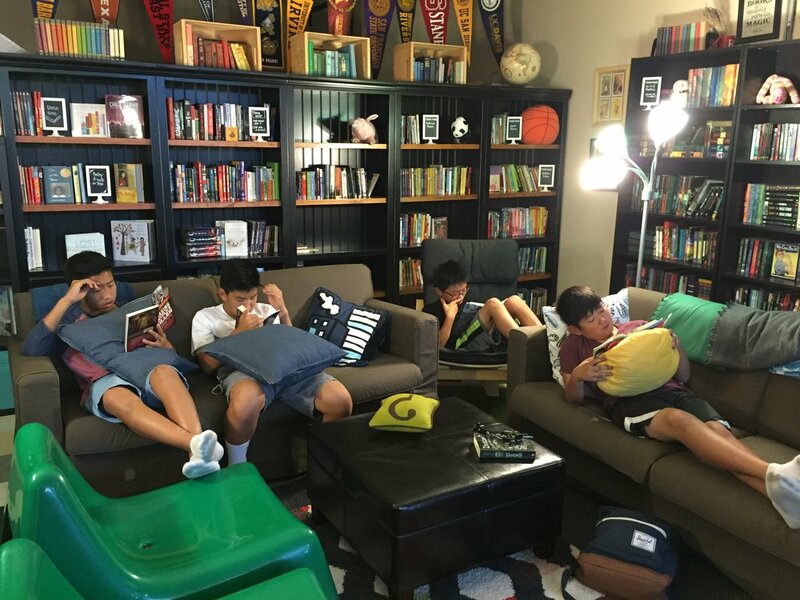 Emily recognized this as a truly extraordinary moment—middle school boys voluntarily reading! Emily inspired a reading revolution across our churches. Church plants started book tables at Sunday services. Candid snapshots of readers encouraged people to "steal reading moments" throughout their daily schedules. Even Pastor Ed got caught up in the reading mania! 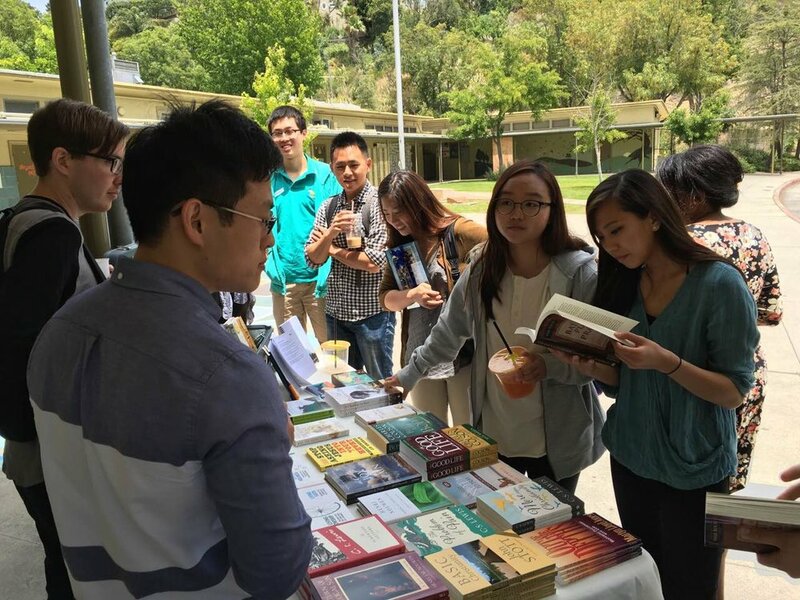 A book table at our UCLA church. 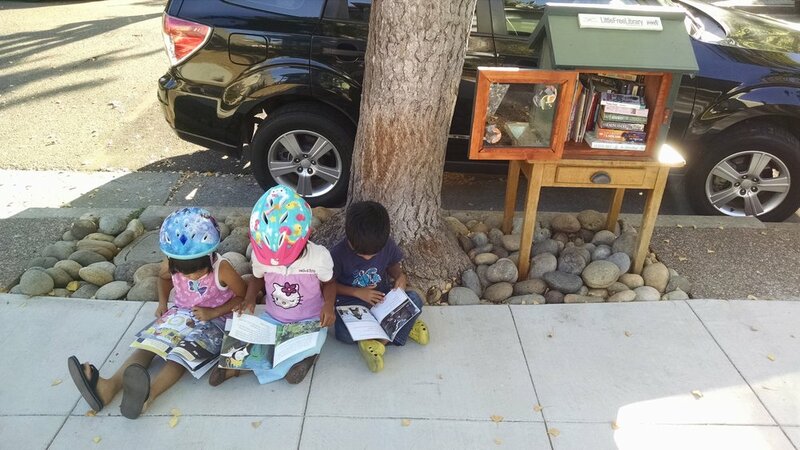 Anywhere in the world can become a place to "steal a reading moment." Even during a bike ride in Alameda! Pastor Ed stealing a reading moment with some kids while visiting Gracepoint Riverside. As Bibliopolis helps us defy the reading statistics of today, we're being transformed from goldfish into bookworms. Check out the Bibliopolis blog for reading inspiration and book reviews and recommendations for readers of all ages—fiction, non-fiction, and Christian books too! Krystal is an avid reader herself and serves in our Elderly Care Ministry at Gracepoint Berkeley.